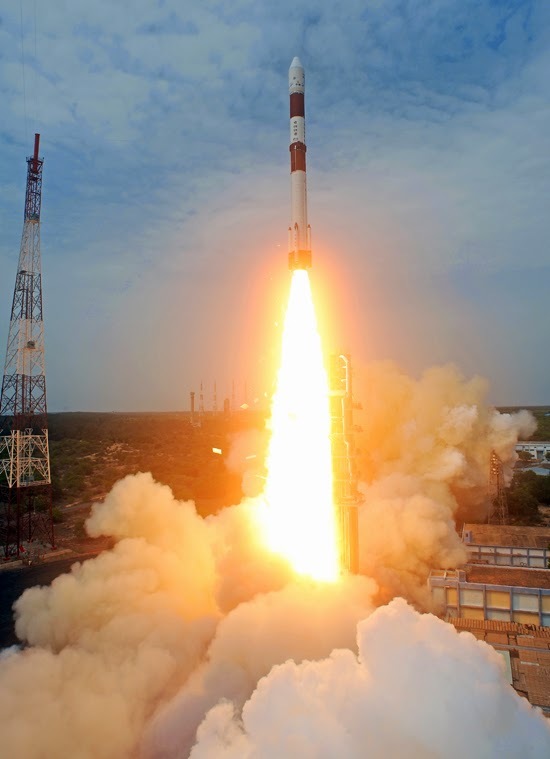 PSLV-C23 Successfully Launches French Earth Observation Satellite- SPOT 7 and four other co-passenger satellites from SDSC SHAR, Sriharikota on June 30, 2014 . PSLV C23 with 5 foreign satellites today. PSLV C23 carrying French Earth Observation Satellite SPOT-7 and four co-passenger spacecrafts from Singapore, Canada and Germany was successfully launched from Sriharikota in Andhra Pradesh and Prime Minister Narendra Modi, witnessed the historic moment. After a perfect lift off from the First Launch Pad in Satish Dhawan Space Centre here at 9.52 AM witnessed by Modi, Indian Space Research Organisation's workhorse Polar Satellite Launch Vehicle PSLV-C23 placed all five satellites into their intended orbits, one after the other between 17 and 19 minutes after liftoff, in textbook precision. Though the Mission Readiness Review Committee and Launch Authorisation Board had on Friday cleared the launch, the launch time was rescheduled to 9.52 AM Monday, a delay of three minutes, attributed to "probable space debris" coming in the rocket's way. Besides its primary payload of 714 kg French Earth Observation Satellite SPOT-7, PSLV C23 carried and placed in orbit 14 kg AISAT of Germany, NLS7.1 (CAN-X4) and NLS7.2 (CAN-X5) of Canada each weighing 15 kg and the 7 kg VELOX-1 of Singapore.